← Can You Get Lost After Death? 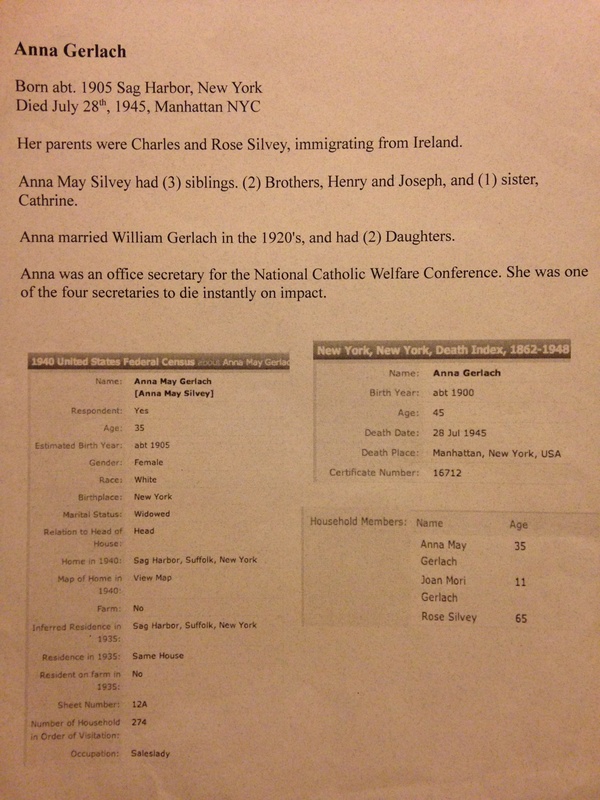 I post again to help my daughter’s quest to find more information on her children she remembered in a past life. We were recently featured on the TV show Ghost Inside My Child on LMN, a Lifetime network. My daughter had remembered a past life in 1945 where she was killed when a B25 plane crashed into the Empire State Building. Remembering healed away her fear of flying. If you find any further information on Anna or her children, please let us know. Thank you! This entry was posted in Metaphysical, Past Life, Regression and tagged Anna Gerlach, children, death, Empire State Building, Family, fear, Ghost Inside My Child, healing, Heaven, life, LMN, near death experience, Parenting. Bookmark the permalink. Watched the show. Fascinating and I found myself searching for more information. I grew up on Long Island. I have had a similar experience. Thank you for your kind words. Let me know if you have any questions about past life or the show. I saved the episode to show my oldest granddaughter. We love these kinds of stories but I also believe them to be true. Not all of them I’m sure, but your daughters experience rang true. I remember the story about the airplane hitting the Empire State Bldg. My grandfather worked on that building and my grandmother worked in the city for Manufacture’s Hanover back during that period. I believe one of them mentioned witnessing the event. I have always believed I’ve had at least one and possibly two past lives. I was told by a Medium once that I’d been on this earth many times before. I have memories that can’t be explained. I would love to hear more about past lives. Anything you’d care to share. Thanks Karen for responding to my last comment. Enjoyed hearing of your and your daughter’s experience. Did a little bit of research, which led to a different Anna Gerlach than the one LMN presented to you. Worth checking into, but it seems your mystery may deepen. Best of luck to you and your family on your path of discovery. I just watched your episode and it was so interesting. I love watching shows like that. I find it very fascinating.I think you should try ancestry.com to help you find more info on Joan and her other sister. That website is very helpful with finding relatives. I hope this will help. Maybe you can keep us updated if you find any new info. Wow just watched the episode and I hope you find her daughters. It’s hard because most women change their last name after marriage it’s also a possibility their mothers last name was not their either. I would love to see the meeting between the two daughters and your daughter. I am bookmarking your site please keep us updated. Good luck! 1930 Census. Husband, William, was 9 years older. He died prior to Anna’s death. Their address at that time was listed as 281 Oak Raul Ave., Sag Harbor, Suffolk, NY. William was a tool maker at a watch factory and Anna didn’t work at the time. More on the siblings than Anna, but perhaps would provide a link to what happened to Anna’s kids? Anna’s street appears to now be called Upper Main Street. Joseph A Silvey (1909 – 1995) was born on February 17, 1909. He was born into the Silvey family. There are no known marriages or children on file for Joseph. Joseph died on August 12, 1995 at 86 years old. Anna’s father, Charles was born in Portugal in 1874 according to 1925 census. He also worked at the Watch Case Factory as a Polisher. Catherine May Silvey (b. June 27 1906 d. July 1978). Married Rossario (Ross) William Frederico in 1929 in East Quogue, NY. Appear to have lived mostly on Lamb Ave., Southhampton, Suffolk, NY. They had two children Ross Frederico (b. 1932) and Bruce Frederico (b. 1934). Hi. I watched the show and I actually was interested so I did some research actually I found something out. I search up Joan mori and I have a screen shot of their household. They live in new York. If you want me to send you the screen shot just reply back. If you have already met them it is no problem.